It's a little basket of pampering. 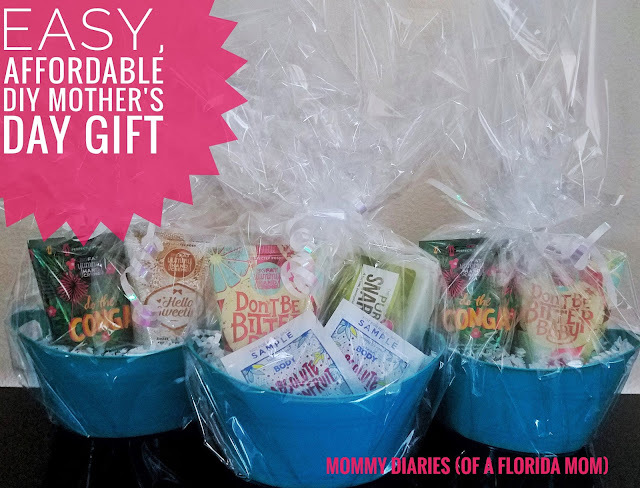 I used Posh products because I've been obsessed with Perfectly Posh lately and know the moms in my life will love Posh too! But you can use whatever products the mom you're buying for adores. I got the baskets pictured from the Dollar Tree - Four for one dollar. The cellophane, paper filling, and ribbon are also from the Dollar Tree. The basket is super easy to assemble. Put the paper filling in the basket. Arrange the goodies that you bought into the basket and wrap the basket in cellophane. Tie a ribbon around the top to secure it closed. Simple, easy, affordable, and a cute gift worth giving. Having skin problems at this age are quite common such as wrinkles or any other problem. So, I would like to gift beauty products to my mom in order to make her more beautiful at this age. So how do we keep such influences away, reduce them or at best, make them positively work for our marriages? Anti aging diet therefore so are here in order to stay and are the anger that is newest. They've been medically proven to increase health insurance and high quality of existence. You need to find out regarding them your health might depend on those foods. Hi, I found that site exceptionally helpful. Having skin issues at this age are very basic, for example, wrinkles or some other issue. Along these lines, I might want to bless excellence items to my mother with the end goal to make her more lovely at this age. Do you have any gifts for lonely elderly? It is cool to have black friday deals now in 2018. Thanks for your this suggestion. It is awesome. I just check to see if we have the deals on nest thermostat black friday in 2018. Thanks. The current year's 1960 restoration isn't about pastiche, so there's a lot of lovely subtleties including strip trims,Helen Hunt Skin Care mandarin collars and affixing choices to give the look a turn and keep it new. On certain track saws, this high grating material may should be cut along the length of the track preceding the primary use.